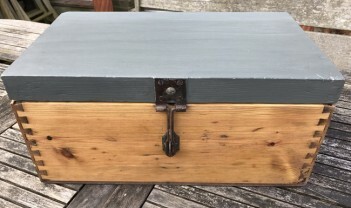 This Victorian Pine small box looks amazing now but when we first got it (as you can see in one of the photos, it was in a terrible state). We have lovingly transformed it into the beauty it is now. We stripped, sanded and painted it with the Grand Illusions Vintage Paint in Fossil Grey. We added the lock part for the hasp. Finally it was polished and waxed. Please click on the photos to see the before and after images and larger photos.